Whenever we think of Australia, an image of a modern country comes to our mind. The modern Australia, no doubt is an epitome of the European settlement happened in the eighteenth and nineteenth century. However, this history of Australia dates back to at least 50,000 years before the European settlement. This is a fascinating piece of Australian history many of us are not aware of. Before the first landing of Dutch that marked the beginning of European settlement, Australia was inhabited by Aboriginal Australians. They were believed to have been arrived 50,000 to 70,000 years before Dutch from Maritime Southeast Asia and were known for their unparalleled culture and traditions which helped them to survive for so long. Therefore, we must try to unearth the reason behind their great survival – the tools they used. The key to the survival of any organism has always been its adaptability to the environment. No creature how mighty they are, would have been able to continue their existence if they do not change themselves according to nature. The scientific history has proved it. Aboriginal knew it very well too. That is why the tools designed by them were based on extensive knowledge of their surroundings and the preys they were going to hunt. In fact, according to the sources, they were first to develop extensive stone technologies to achieve different kind of stone tools. They designed ground edges to make effective cutting tools to cut and chop food, wood or animals so that they could use their skin. Not just that, when they realized the huge advantages of metals on stone along with ceramics, glass; they keenly used them in their tools and weapons. Spears – They were made from wood, spears were mostly used for fishing, hunting, and fighting. The spears were differently made around the country. The Aboriginals of Tasmania used long spears almost 6 meters in length while in Kimberly regions composite spears with heads made up of stones were also discovered. That must have been depended on the geographical locations. North and South east of Australia are reported with multi- pronged spears used for fishing. 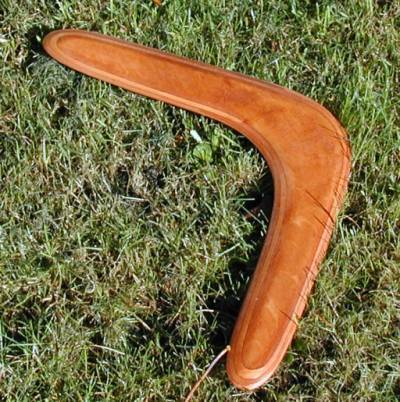 The boomerang was indeed a highly skilled weapon invented by the Aboriginals. Used primarily for hunting, it was sufficient for killing not only smaller animals but pretty effective on larger ones too. Again in different geographical conditions, they were crafted differently; such as in deserts heavy wood were used for kangaroos hunting while in New South Wales Coast, they were made up of lighter woods to facilitate duck hunting. Woomera Spearthrowers – The Woomera was a special spearthrower invented by them and often cited as the fastest weapon before the invention of self-loading rifle. Made of wood, woomera acts as a lever to increase the throwing speed of spear. It was an excellent multipurpose tool because of its efficiency in killing, chopping and tearing and also due to its ability of easily carrying around. Message sticks – With 200 languages with 600 dialects but without any written language, Aboriginals communicated effectively with the message sticks. The tools and weapons used by the Australian Aboriginals prove their great skill of invention and deep understanding the environment. No doubt they were able to survive so long beating all odds.